So I purchased a brand new Nikon 77mm NC filter for my Nikon 24-70mm f2.8G to protect the lens from dings, scratches and elements (I know there are people who dislike filters because it degrades the image quality but its nothing Lightroom can't fix considering I'll be post processing the image anyways. The filter I purchased was from eBay and the seller was located in Hong Kong. My gut instinct told me that it was more than likely a fake but the seller had a reputation and the price was affordable. So I took the chance. Having received the filter, it looked very well made and legit. 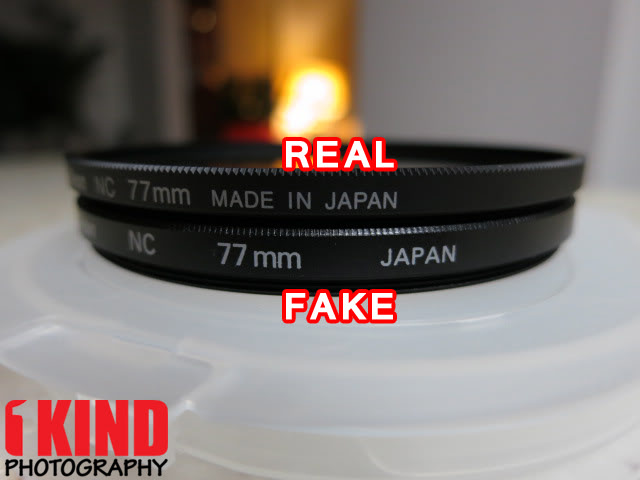 I did some searching online to see if anyone had compared an authentic filter to a counterfeit. There wasn't much information but from what I've read and the minimal information available, it had all the information of a real filter. I decided to go out and purchase a Nikon 77mm NC filter from an authorized Nikon retailer just to compare for myself since there was no definite answers or comparison pictures available on the web. 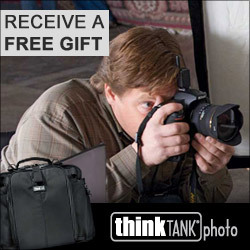 When you purchase from an authorized Nikon retailer such as B&H Photo and Adorama, you know its legit. Amazon is legit as well but you have to make sure its "Sold by Amazon.com" and not from a third party seller that says "Sold by...and Fulfilled by Amazon.". 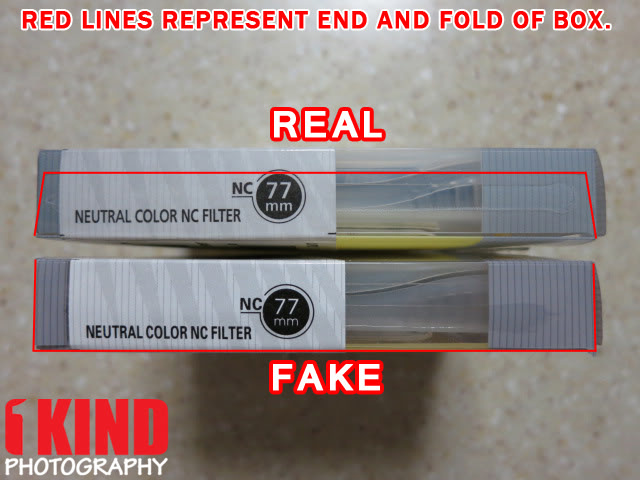 The fake filter and packaging is almost identical that it can pass as real to an average buyer. The only way someone would know is if they had the real product next to them to compare. But this tutorial will help tell you whether or not what you own/purchased is the real thing since there is nothing on the web...until now. This would probably apply to ALL Nikon filters. Did you get it right? 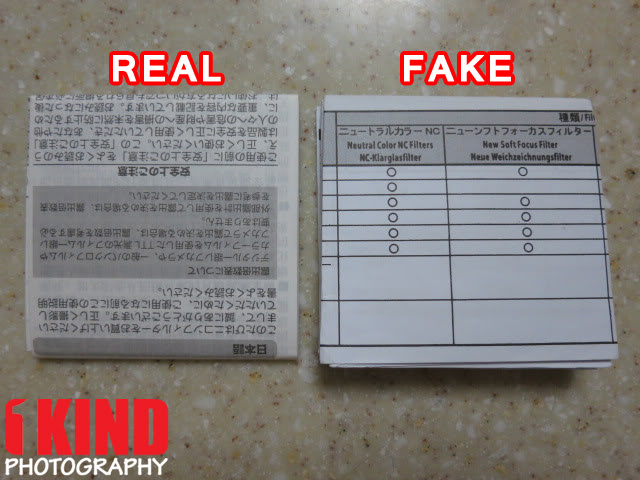 I'll explain how to tell the which is real and which is fake below. *NOTE: I know there's no real way of comparing filters unless you have an authentic one next to you to do a side by side comparison. 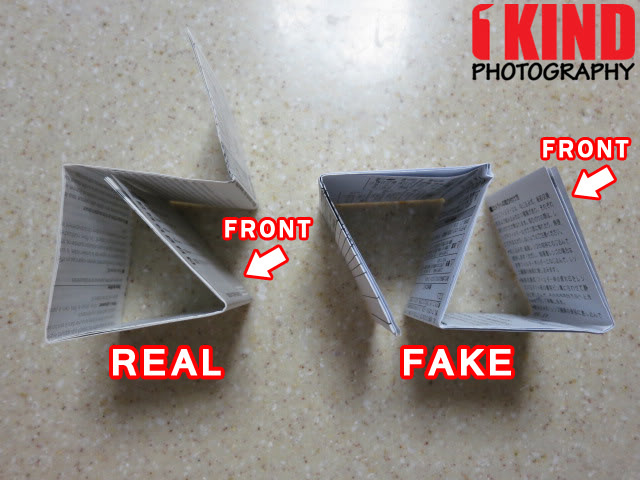 Hopefully this tutorial will pin point some areas that you can definitely recognize as a potential counterfeit. Granted, filters is just a piece of glass but please purchase your OEM battery grips, batteries and battery chargers from authorized dealers. 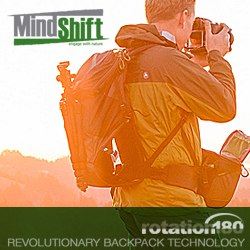 Counterfeit items can cause damage to your camera. Why risk saving a few bucks when you can be losing more? If the price is too good to be true, it probably is. As you can see from the front of the package, it looks identical. But there are slight differences. The bars at the top and bottom are different shades of gray. 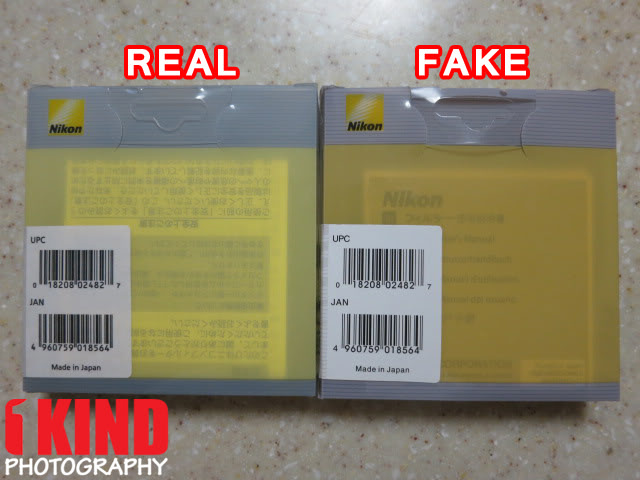 The Nikon logo on the real package (left) is vibrant and in the middle of the gray bar. 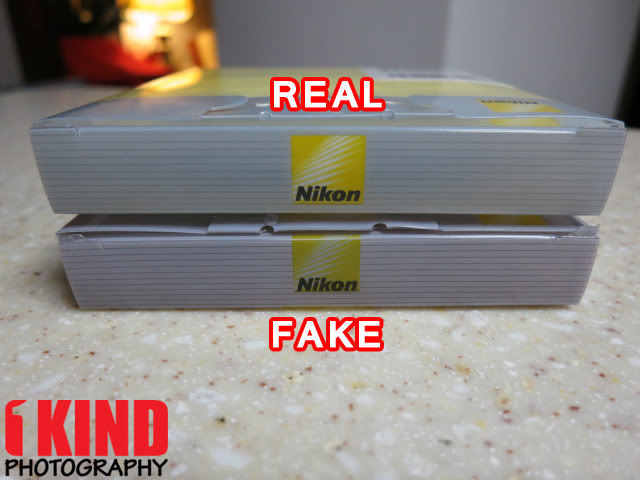 The Nikon logo on the fake package (right) is dull and at near the top edge. The back is similar to the front. The UPC both have the same number and barcode but to the naked eye without comparing side by side, they are the same. But the fonts are slightly different. The real label is slightly bolder. You can also tell that the yellow on the real package is yellow where as the fake package was more orange looking. The gray also bleeds into the hang tab on the fake. The sides look about identical. However, I did notice that the end of the packaging where they seal the package looked different. 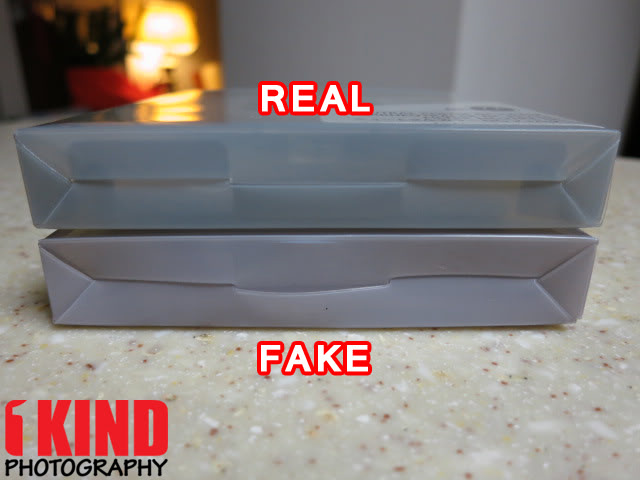 On the fake package, it had a square edge. On the real package, it had a trapezoid edge. You can see my outline of where the edge is. The same differences found on the front of the package can be seen on the top and bottom. Dull colors and different shades of gray. The real package looked a bit more transparent. The instruction manual looked identical but definitely completely different and noticeable without needing to compare. The fake instruction manual is thicker and white as if it was printed on normal printing paper. The real instruction manual was thinner and more transparent and had a newspaper feel to it. The way it was folded is also different. I pointed out where the front of the manual is and had them face the same way. You can see that the way the manual was folded is different. I didn't bother unfolding the manuals completely as these were enough to show the differences. And who really reads them? The front of the filter case looks exactly the same. It has the Nikon logo, CP-15 and 77mm, all molded into the case. 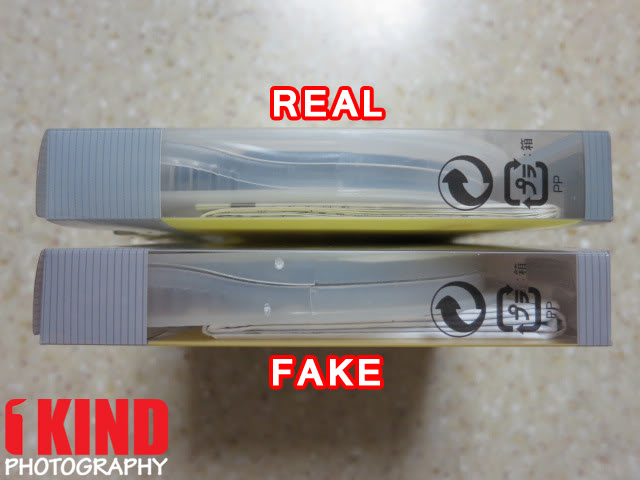 You can also see that the real case is slightly more transparent (clear) where as the fake case is more opaque (cloudy). On the back of the case, both have "MADE IN JAPAN" molded into the case but one small thing is different. >PP< is molded on the inside of the real case. On the back of the case, its looks backwards (as shown in picture). This is not molded on to the fake case. But most importantly is the filter itself. Both are glass and you can tell by the weight and by tapping it. But from what I've read online when I did my search to see how I can tell if it was real or fake was to take a look at the font for the Nikon logo. It's hard to tell if its correct or not when you have nothing to compare it to. As you can see from the image, the Nikon logo is ever so slightly different and so are the colors. The logo on the real filter is slightly more bold. 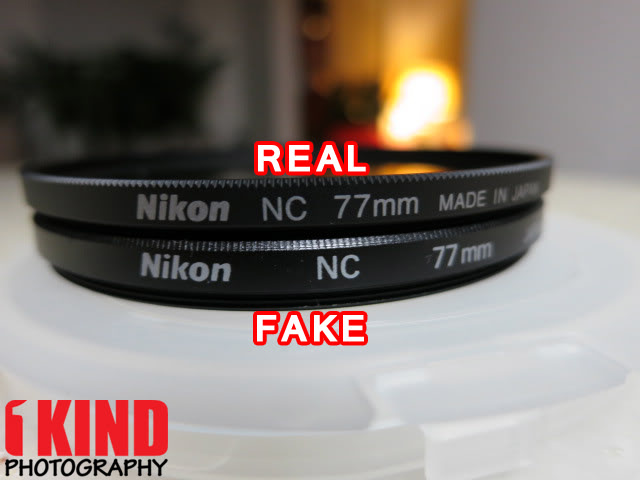 The "Nikon NC 77mm MADE IN JAPAN" is also closer together where as the fake is more spread apart and is missing "MADE IN...". The "77" is slightly different as well. On the real filter, it has a curved bottom where as the fake is straight. 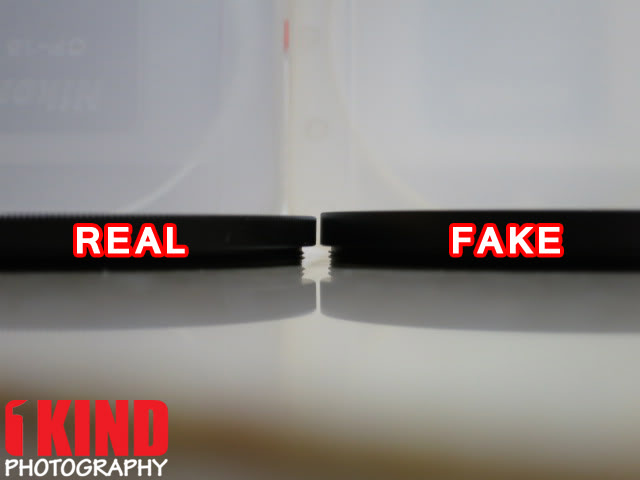 When laid flat side by side, the real filter is slightly thinner than the fake filter. You must ask, how am I sure that its fake and not real? There are a lot of differences between the two. 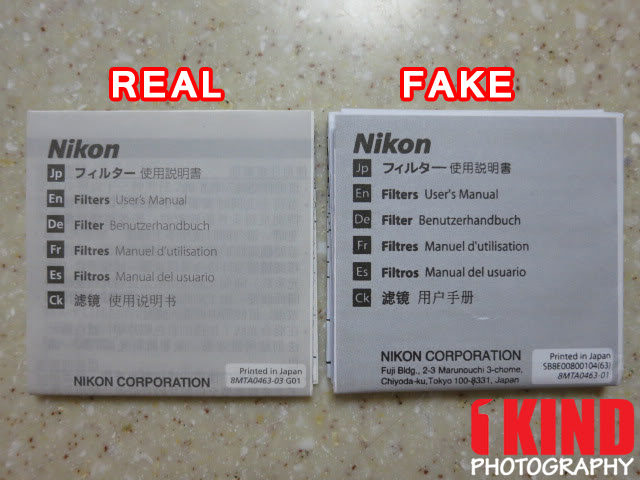 The real filter was purchased from an authorized Nikon retailer. When items are manufactured, they are all consistent in packaging and design when it comes off the production line, especially when they are "Made in Japan". They never vary. I can go to a different authorized Nikon retailer and it would be identical to the one shown above. The fake looks real when you have nothing else to compare it to but they always leave out things that make it stand out without the need to compare it to something (I.E. manual). Other than packaging and filter appearance, is there any difference in the quality of pictures? Honestly, I couldn't tell a difference. Even just placing both filters on a white piece of paper, they both looked clear. As stated in the beginning, there's nothing a little post processing in Lightroom, Aperture, Photoshop or other photo editing programs can't fix or adjust. Want to avoid being scammed? 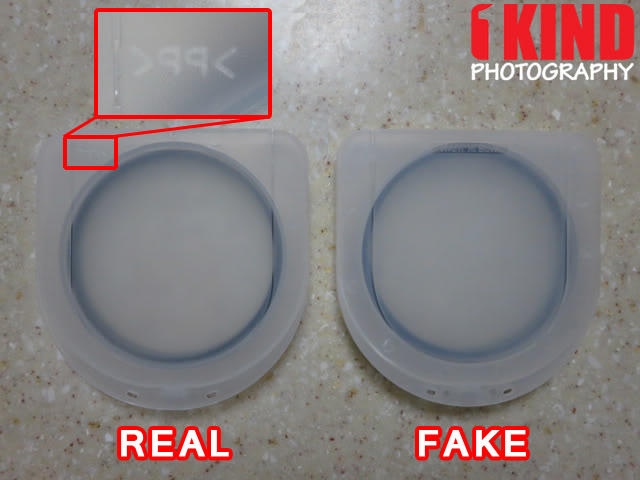 Avoid purchasing filters from eBay...especially from sellers in Hong Kong, China or Asian countries. These are where counterfeits usually come from (just look at all the fake Sandisk memory cards on eBay). For sense of security and comfort, I highly recommend purchasing real filters from B&H Photo or Adorama. You can't go wrong. 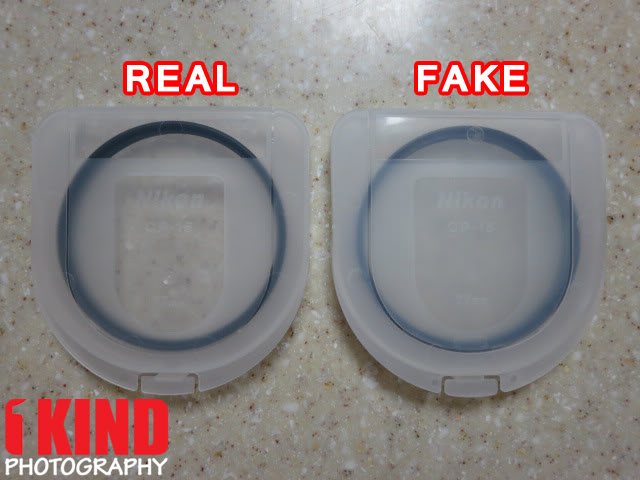 B&W filters is another filter that has fakes and is highly copied. This article was featured on NikonRumors, Fstoppers, Crave Asia (Asia CNET), Crave CNET, UniquePhoto.